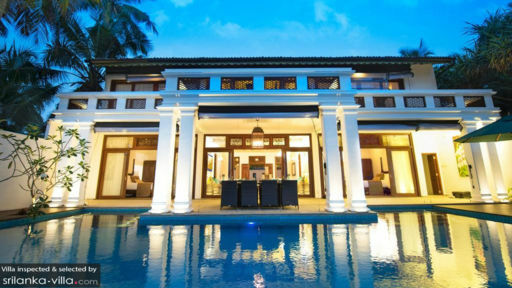 A breathtaking holiday rental situated right across Hikkaduwa beach in Sri Lanka, Villa 46 is straight out of a magazine with its traditional Sri Lankan architecture inspired by years of history and culture. Designed by architects Marvan & Neluni Atapattu, the villa is utmost luxury being afforded to families, friends, and others. With four bedrooms named after revered Sri Lankan flowers, the villa is a bespoke tropical holiday experience that you get to live first-hand while lounging on a daybed, drink in hand, and the Indian Ocean sprawling across from you! 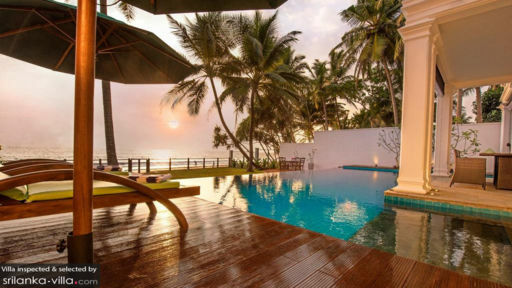 Villa 46 offers guests four, one-of-a-kind bedrooms with four-poster beds and double beds with quality linen and luxurious interiors, each named after a much-loved flower in Sri Lanka – Araliya, Orchid, Nelum, Manel. Two bedrooms are located on the ground floor with access to the porch, while two are found on the first floor offering splendid views of the Indian Ocean across private balconies. Both the porch and the balconies are furnished with chairs and a coffee table, perfect for a morning or evening tea for a serene and meditative moment to yourselves. There are 32” satellite TVs, tea/coffee facilities, and a safe for your valuables in the bedrooms. En-suite bathrooms with hot/cold shower, and other amenities is found with each bedroom. Offering direct access to the beach, the villa outdoors is occupied mainly by the private swimming pool that overlooks the ocean and gives you an infinity pool vibe. There is a vast stretch of pristine, white sandy beach separating the villa from the beach that is an advantageous avenue for guests to frolic in the sun with the water tickling your toes! Lush green gardens that have been manicured to perfection, palm trees casting their shade on the grass, and lotus ponds mark the landscape. There is an alfresco dining area on the terrace as well for you to enjoy the sun on your backs even while eating a fresh, delicious meal. Relax on the pool deck or lounge on the garden while immersing yourself in the beautiful view. The grand living area at Villa 46 is an example of absolute elegance and opulent living as it is furnished with luxurious sofas accented with turquoise cushions all under a traditional ceiling. On the first floor, a lounge can be found with a statement chandelier right in the centre of the ceiling streaking the room as if in gold. Plush, beige sofas, winged chairs, and armchairs all form part of the comfortable seating. A 65”, flat-screen TV is afforded to guests as a bit of modern comfort amidst traditional interiors. An alfresco dining area is found out on the pool deck with an eight-seater dining table so guests can eat while enjoying the clear, starry-night sky. A room within a room, an age-old architectural technique is what you’ll find here at Villa 46. For your culinary needs, the chef is happy to assist you in preparing delectable Sri Lankan meals that you can even learn for yourselves with help from a professional. Apart from the luxurious living arrangements which are bound to leave you breathless and in awe, the villa even provides services to ensure that the villa remains spotlessly clean and well-managed throughout your stay. There is daily housekeeping, complimentary WI-Fi, and others for the upkeep and management. 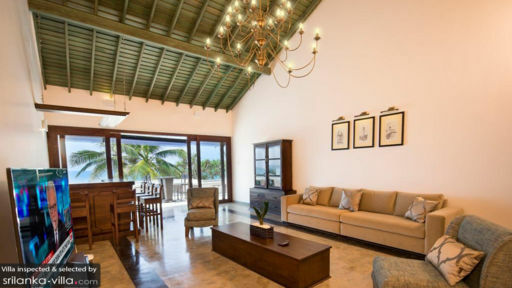 The villa is right on Hikkaduwa beach, convenient since you can easily traverse to the sandy shores for a nice day out in the sun. There are a host of water activities for you like diving and snorkelling, as well as spotting marine life! The nightlife in Hikkaduwa is bustling and is sure to leave you with lots of memories.